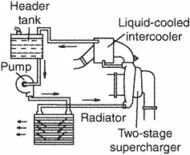 A heat exchanger for cooling fluid between stages of a multistage compressor with consequent saving in power. A precooler or a heat exchanger that is like a radiator. It is a component of an air-conditioning system fitted between a compressor and the turbine of a cold air unit or that used between the turbocharger and the cylinder of a reciprocating engine. Interestingly, although additive manufacturing has previously been used in Formula 1, the current project is unique due to the large scale and cross flow nature of a car intercooler. It is one thing to see an intercooler as a simple entry in a textbook, but to witness the actual hardware as it crawled down the road was awe-inspiring. The pressure side of the compressor required a manifold and intercooler mount casting that met the space limitations of the design. The Swedish engineering group Opcon AB said on Monday (19 January) that its subsidiary Laminova Production AB had secured a SEK20m contract for car engine intercoolers from the German vehicle supplier Georg Fischer. 9 litre turbocharger, with intercooler direct-injection diesel, fourcylinder engine. The engine features electronically controlled fuel injection and an intercooler. The high-octane flagship model uses a state-of-the-art supercharger and intercooler to squeeze 163bhp out of the traditional four-cylinder engine. The new OMEN is the fastest near silent PC on the market, equipped with a system-wide intercooler that silently cools the Quad-Core processor, choice of ATi Crossfire or nVidia SLI graphics cards and motherboard chipsets. The model features a Cadillac crest in the middle of the scalloped mesh grille; a lower grille that appears to be positioned to allow air to flow over an intercooler and vertical tail lamps integrated into the C-pillars. In 1926, 23-year old Indy racer Frank Lockhart developed and patented an intercooler for his supercharged Miller racer.